Islamabad, Aug 24 (IANS) Prime Minister Shahid Khaqan Abbasi on Thursday met the top military leadership to formulate a response to the new US policy on Afghanistan that includes greater pressure on Islamabad to do more to rein in militants. The meeting was attended by senior civil and military officials, including the Chairman of the Joint Chiefs of Staff Committee and service chiefs, besides the Defence, Interior, Foreign Affairs and Finance Ministers. Inter-Services Intelligence (ISI) Director General Lt Gen Naveed Mukhtar and National Security Adviser Lt Gen Nasser Janjua (retd) were also in attendance, Geo News reported. Sources said the Director General of Military Operations briefed the meeting over the ongoing military operations on the Pakistan-Afghan border as well as the internal security situation of the country and the situation along the Line of Control in Jammu and Kashmir. The weekly press briefing of the Foreign Office was postponed until Friday in view of the National Security Committee (NSC) meeting — the Prime Minister’s second since he assumed office on August 1. 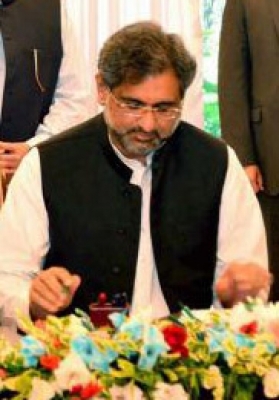 Abbasi’s first NSC meeting was held on August 16 and focused on the situation in Jammu and Kashmir and “unprovoked” cross-border firing. Abbasi on Wednesday dashed to Saudi Arabia for a day-long visit following Trump’s policy speech, and held a meeting with Saudi Crown Prince Mohammad bin Salman. The national security meeting is being held to come up with a combined response after President Donald Trump chastised Pakistan for harbouring terrorists and providing safe havens to militant groups waging an insurgency against a US-backed government in Kabul. White House officials have gone further and threatened aid and military cuts, as well as other measures to force Pakistan’s hand and force them to help bring about an end to the 16-year-old war. Abbasi was yet to respond to Trump’s remarks, but Foreign Minister Khawaja Asif said Washington must work with Islamabad “instead of relying on the false narrative of safe havens”. Pakistan denies harbouring militants. Army chief General Qamar Javed Bajwa, who is part of the meeting, on Wednesday told US Ambassador David Hale that Islamabad will continue to do what it is doing in Afghanistan out of its national interests, not to appease Washington. Hale called on the Army chief and told him that the US valued Pakistan’s role in the war against terror and was seeking cooperation from it to resolve the Afghan issue, a statement from the Inter-Services Public Relations said.